Inshore fishing vessels, leisure craft and commercial vessels offering sightseeing and angling day trips all use Arbroath Harbour in Angus, Scotland. With 59 floating pontoons berths, Arbroath has an inner and outer harbour separated by half height dock gates (which maintain a minimum of 2.5 metres of water in the inner harbour). Access to the harbour is narrow with rocky reefs restricting the approach, and also an abnormally high number of lobster pots! Mariners are advised to stay well off shore before turning in towards the harbour, and therefore the harbour’s two prominent leading lights are a vital aid to navigation when onshore landmarks are not visible. 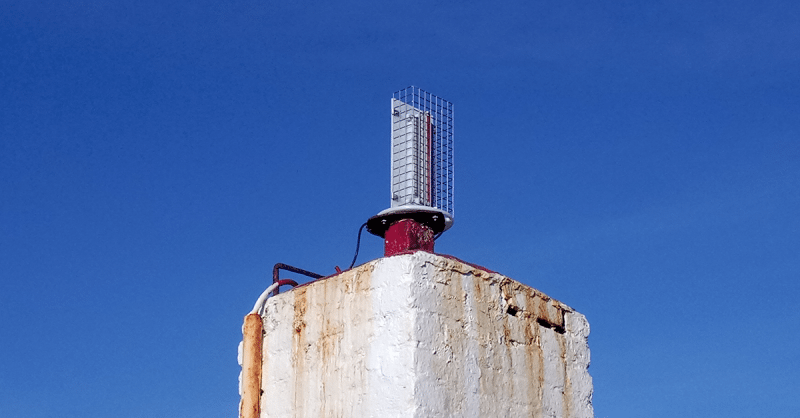 Arbroath Harbour’s existing leading lights (Category 1) had suffered failures and been repaired on occasion. With new LED technology offering better performance, sustainability and reduced costs, we were asked to replace the two existing leading lights at Arbroath with new LED leading lights. 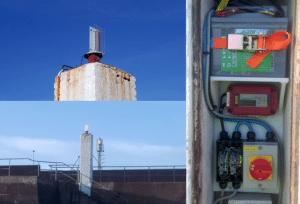 The Arbroath Harbour Joint Consultative Committee agreed to the installation of two VLL43 linear leading lights with a minimum range of five miles. With this system, the range required can be extended using multiple units: up to 11NM night at 0.74T. While replacing existing leading lights would seem like a straightforward task, each harbour has its own challenges that mean out-of-the-box solutions don’t necessarily work. In the case of Arbroath Harbour, stones were the problem. Historically, the front lead light had taken a battering from stones being washed over the harbour wall, which had caused damage to the existing light and affected its performance. Without an easy fix, we resorted to a custom made solution designed by Jeff Gibson, Sales Director, who looks after our customers in Scotland. His solution was to design custom mounts to ensure the leading lights were securely fixed to their location, and stone guards to protect the units from damage. This means that any stones that get washed over the wall are unlikely to affect the performance or longevity of either leading light. Another factor that needed to be addressed when installing these new navigation aids was power. At Arbroath the leading lights are powered by the mains supply, which meant that a slim power supply was needed to the mast. Hydrosphere worked with a local contractor, Contact Electrical Services Ltd, to ensure that a safe and reliable power source was installed. Critically this also needed to withstand the impact of any stones during high tides and stormy weather conditions. LED lead light systems like the VLL43 offer excellent performance, flexibility and functionality. Technical experts like Jeff Gibson not only advise on the best technology for your needs, but also overcome challenges and design bespoke solutions depending on the location and environmental factors.